George Albee was born in Lisbon, New Hampshire. He enlisted in Company G (Wisconsin), Berdan's Sharpshooters in June 1862. After two months in the field he was wounded at the Second Battle of Bull Run and discharged for disability while convalescing. 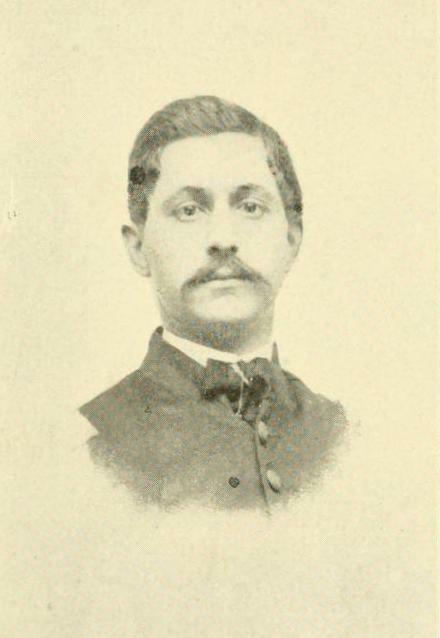 In1863 he enlisted again as an artilleryman in the 3rd Wisconsin Light Artillery but was discharged to accept a commission as 2nd Lieutenant in the 36th Wisconsin Infantry; he was later promoted to 1st Lieutenant. After the Civil War Albee served as a lieutenant in the 36th U.S. Colored Infantry (1866), 41st U.S. Infantry (1866–1869), 24th U.S. Infantry (1869-1878). 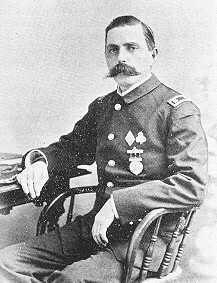 Albee was awarded the Medal of Honor in January 1894 for his actions in Brazos River, Texas on October 28, 1869 while serving with the 41st United States Infantry Regiment. Viet Nam Congressional Medal of Honor Recipient. 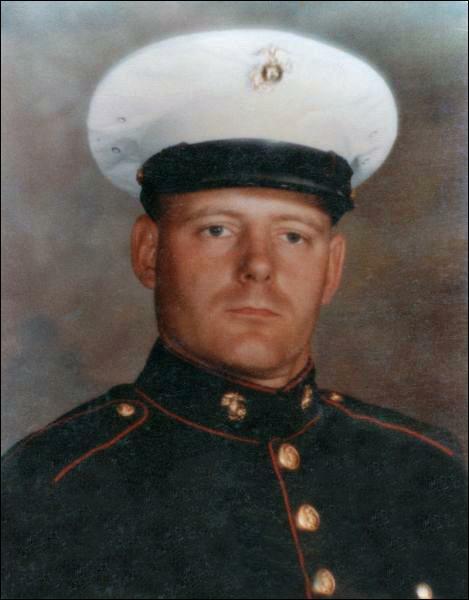 Served in the United States Marine Corps during the War in Viet Nam as a Lance Corporal in Company F, 2nd Battalion, 4th Marines, 3rd Marine Division (Rein), FMF. He was awarded the CMOH for his bravery near Con Thein, Republic of Vietnam on September 21, 1967. 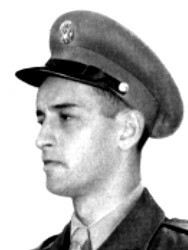 His citation reads "For conspicuous gallantry and intrepidity at the risk of his life above and beyond the call of duty while serving as a machine gunner with Company F. During a reconnaissance operation L/Cpl. Barker's squad was suddenly hit by enemy sniper fire. The squad immediately deployed to a combat formation and advanced to a strongly fortified enemy position, when it was again struck by small arms and automatic weapons fire, sustaining numerous casualties. Although wounded by the initial burst of fire, L/Cpl. Barker boldly remained in the open, delivering a devastating volume of accurate fire on the numerically superior force. The enemy was intent upon annihilating the small marine force and, realizing that L/Cpl. Barker was a threat to their position, directed the preponderance of their fire on his position. He was again wounded, this time in the right hand, which prevented him from operating his vitally needed machine gun. Suddenly and without warning, an enemy grenade landed in the midst of the few surviving marines. Unhesitatingly and with complete disregard for his personal safety, L/Cpl. Barker threw himself upon the deadly grenade, absorbing with his body the full and tremendous force of the explosion. In a final act of bravery, he crawled to the side of a wounded comrade and administered first aid before succumbing to his grievous wounds. His bold initiative, intrepid fighting spirit and unwavering devotion to duty in the face of almost certain death undoubtedly saved his comrades from further injury or possible death and reflected great credit upon himself, the Marine Corps, and the U.S. Naval Service. He gallantly gave his life for his country". His Medal was presented to his family on October 31, 1969 at the White House by Vice-President Spiro T. Agnew. 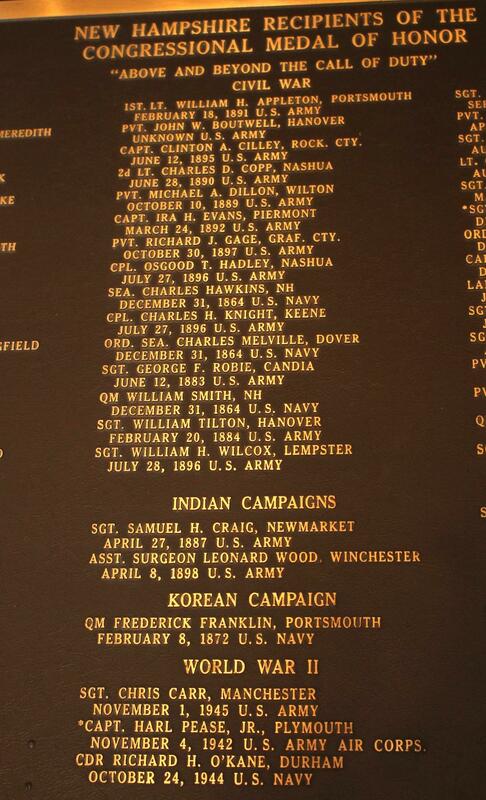 His name can be found on Panel 26E, Line 99 on the Viet Nam Memorial in Washington, DC. Born at Lake Village, New Hampshire, July 27, 1832, he entered the Volunteer Service for the Civil War in 1861 and rose through the ranks to Brigadier General on March 13, 1865. 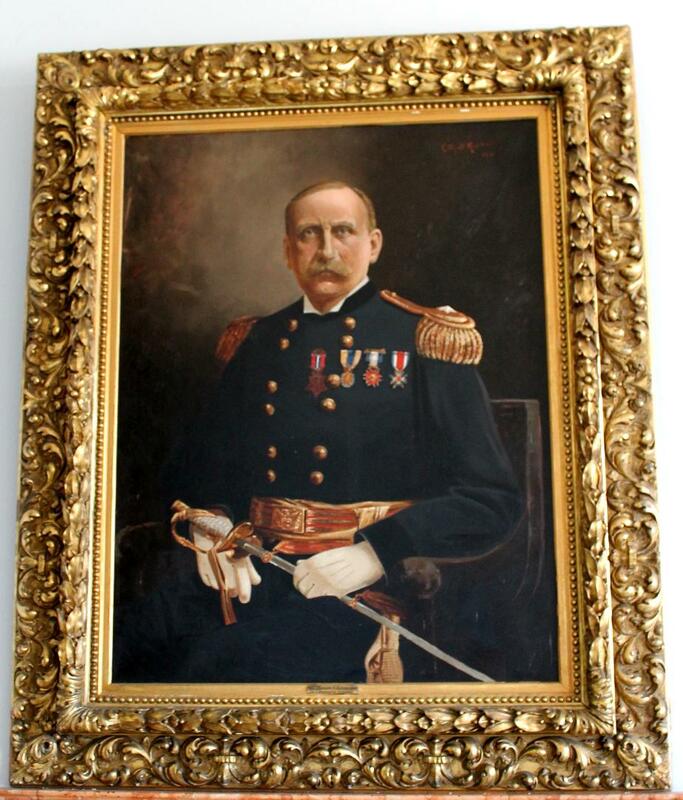 After the Civil War, he remained in the Regular Army and became Brigadier General, United States Army, and Quartermaster General, June 26, 1890. He remained unmarried. First Lieutenant, 1st New Hampshire Volunteer Infantry, May2, 1861 and mustered out from that unit on August 9,,1861. Then was appointed Captain, Assistant Quartermaster of Volunteers, August 3, 1861 to June 8, 1865; Lieutenant Colonel, Quartermaster, August 1, 1864-September 5, 1865; Captain, Quartermaster Corps, United States Army, February 16, 1865 and was bereveted Brigadier General for war service. Awarded the Medal of Honor on May 20, 1895 for gallantry in action against Mosby's guerrillas between Catlett's and Fairfax Stations, Virginia, on October 13-15, 1863. He retired from the Army on July 27, 1896. 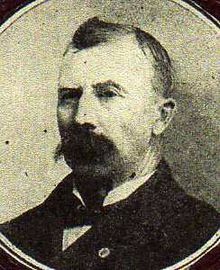 Charles Dearborn Copp -Born in Warren NH April 12, 1840. 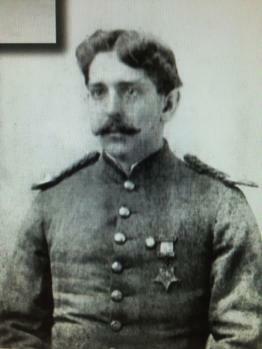 Civil War Congressional Medal of Honor recipient. He was a Second Lieutenant with Company C, 9th New Hampshire Infantry and was awarded the Medal of Honor for heroism at Fredericksburg, Virginia. His official CMOH citation reads as follows: Seized the regimental colors, the color bearer having been shot down, and, waving them, rallied the regiment under a heavy fire. 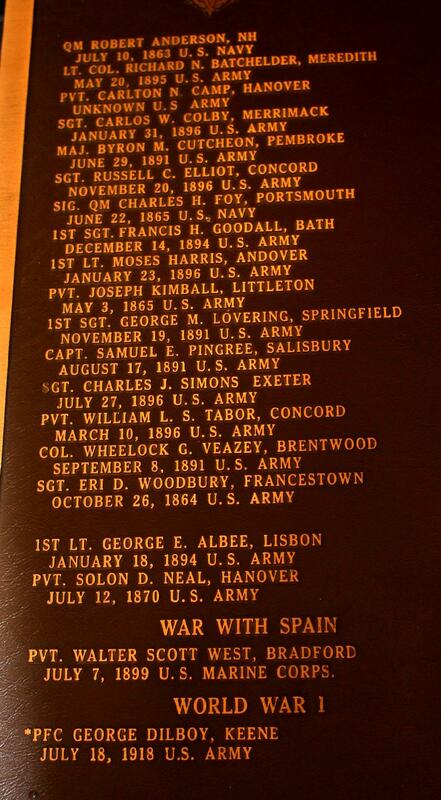 Rank and Organization: Second Lieutenant, Company C, 9th New Hampshire Infantry. Place and Date: At Fredericksburg, Va., 13 December 1862. Entered Service At: Nashua, N.H. Born: 12 April 1840, Warren County, N.H. Date of Issue: 28 June 1890. 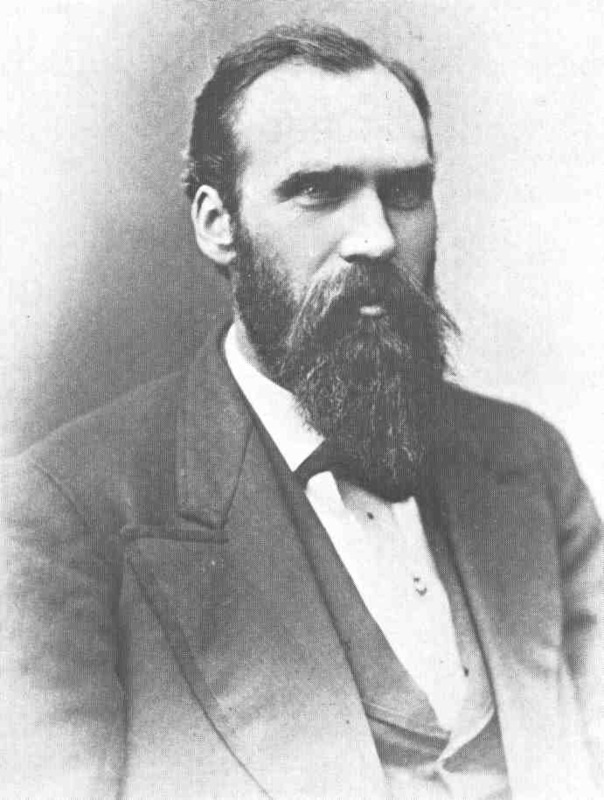 CUTCHEON, Byron M. Cutcheon, Born in Pembroke, Merrimack County, N.H., May 11, 1836; attended the common schools and Pembroke Academy; taught school in Pembroke for several years; moved to Ypsilanti, Mich., in 1855; principal of Birmingham Academy, Oakland County, in 1857; attended Ypsilanti Seminary, and was graduated from the University of Michigan at Ann Arbor in 1861; professor of ancient languages in the Ypsilanti High School 1861 and 1862; enlisted in the Union Army in 1862 and served in the Twentieth Regiment, Michigan Infantry, attaining the rank of lieutenant colonel; commissioned colonel of the Twenty-seventh Regiment, Michigan Infantry November 12, 1864; commanded the Second Brigade, Second Division, Ninth Army Corps, from October 16, 1864, until his resignation on March 6, 1865; was graduated from the University of Michigan Law School in 1866; was admitted to the bar the same year and commenced practice in Ionia, Mich.; moved to Manistee, Mich., in 1867; member of the board of control of railroads of Michigan 1867-1883; city attorney of Manistee, Mich., 1870-1873; prosecuting attorney of Manistee County, Mich., in 1873 and 1874; regent of Michigan University 1875-1881; postmaster of Manistee, Mich., 1877-1883; elected as a Republican to the Forty-eighth and to the three succeeding Congresses (March 4, 1883-March 3, 1891); chairman, Committee on Military Affairs (Fifty-first Congress); unsuccessful candidate for reelection in 1890 to the Fifty-second Congress; awarded a Medal of Honor by Congress June 29, 1891, “for distinguished gallantry at the Battle of Horseshoe Bend, Ky., May 10, 1863”; appointed civilian member of the Board of Ordnance and Fortifications by President Harrison in July 1891 and served until March 25, 1895; editorial writer for the Detroit Daily Tribune and Detroit Journal 1895-1897; resumed the practice of law in Grand Rapids, Mich.; died in Ypsilanti, Washtenaw County, Mich., April 12, 1908; interment in Highland Cemetery. "For conspicuous gallantry and intrepidity at the risk of his life above and beyond the call of duty as Commanding Officer of the USS TANG operating against two enemy Japanese convoys on October 23 and 24, 1944, during her Fifth and last War Patrol. Boldly maneuvering on the surface into the midst of a heavily escorted convoy, Commander O'Kane stood in a fusillade of bullets and shells from all directions to launch smashing hits on three tankers, coolly swung his ship to fire at a freighter and, in a split second decision, shot out of the path of an onrushing transport, missing it by inches. Boxed in by blazing tankers, a freighter, transport and several destroyers, he blasted two of the targets with his remaining torpedoes and, with pyrotechnics bursting on all sides, cleared the area. Twenty-four hours later, he again made contact with a heavily escorted convoy steaming to support the Leyte campaign with reinforcements and supplies and with crated planes piled high on each unit. In defiance of the enemy' relentless fire, he closed the concentration of ships and in quick succession sent two torpedoes each into the first and second transports and an adjacent tanker, finding his mark with each torpedo in a series of violent explosions at less than a thousand-yard range. With ships bearing down from all sides, he charged the enemy at high speed, exploding the tanker in a burst of flame, smashing the transport dead in the water and blasting the destroyer with a mighty roar which rocked the TANG from stem to stern. Expending his last two torpedoes into the remnants of a once powerful convoy before his own ship went down, Commander O'Kane aided by his gallant command, achieved an illustrious record of heroism in combat, enhancing the finest traditions of the United States Naval Service." Richard Hetherington O'Kane was born in Dover, NH on 2 February 1911. He graduated from the U.S. Naval Academy in 1934, served aboard the cruiser Chester and destroyer Pruitt, received submarine instruction in 1938, and served on USS Argonaut until 1942. Lieutenant O'Kane then joined the pre-commissioning crew of the submarine Wahoo, serving as her Executive Officer under Commanding Officer Dudley W. Morton, and establishing a record as a very promising tactician. In July 1943, Lieutenant Commander O'Kane became Prospective Commanding Officer of USS Tang, which he commanded throughout her entire career. In five war patrols, Tang sank an officially recognized total of 24 Japanese ships, establishing one of the Pacific War's top records for submarine achievement. He was captured by the Japanese when his ship was sunk off China in October 1944, and was secretly held prisoner until the war's end ten months later. Following his release, Commander O'Kane was awarded the Medal of Honor for his "conspicuous gallantry and intrepidity" during his submarine's final operations against Japanese shipping. Following WW II, Commander O'Kane served in the Pacific Reserve Fleet as Commanding Officer of the submarine tender Pelias, testified at Japanese war crimes trials, was Executive Officer of the submarine tender Nereus and Commander of Submarine Division 32. He attended the Armed Forces Staff College in 1950-51, and was assigned to Submarine School at New London, CT, initially as an instructor and, in 1952-53, as Officer in Charge. Promoted to Captain in July 1953, he commanded the submarine tender Sperry until June 1954 and became Commander Submarine Squadron Seven. 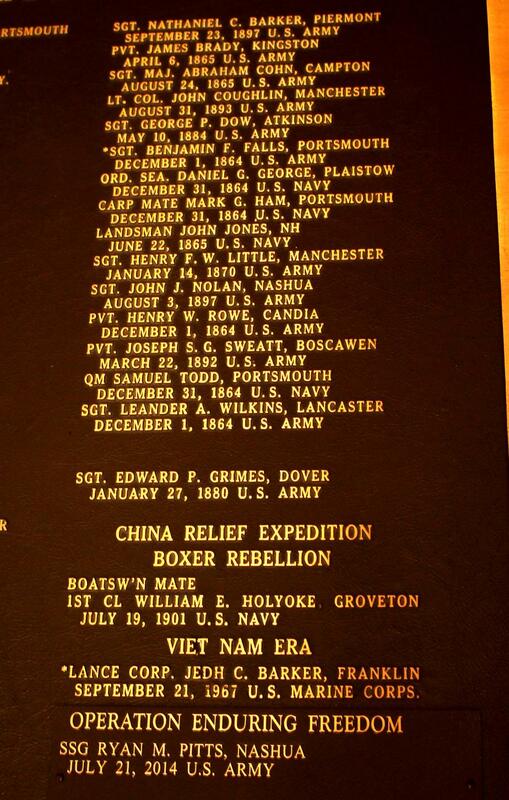 After attending Naval War College in 1955-56, he served in Washington, DC, with the Ship Characteristics Board. Captain O'Kane retired in July 1957 and, on the basis of his extensive combat awards, was simultaneously advanced to Rear Admiral on the Retired List. He died on 16 February 1994. The guided-missile destroyer USS O'Kane (DDG-77) is named in honor of Rear Admiral O'Kane. 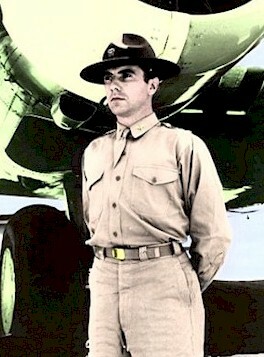 World War II Congressional Medal of Honor recipient. Born in Plymouth, New Hampshire April 10, 1917. 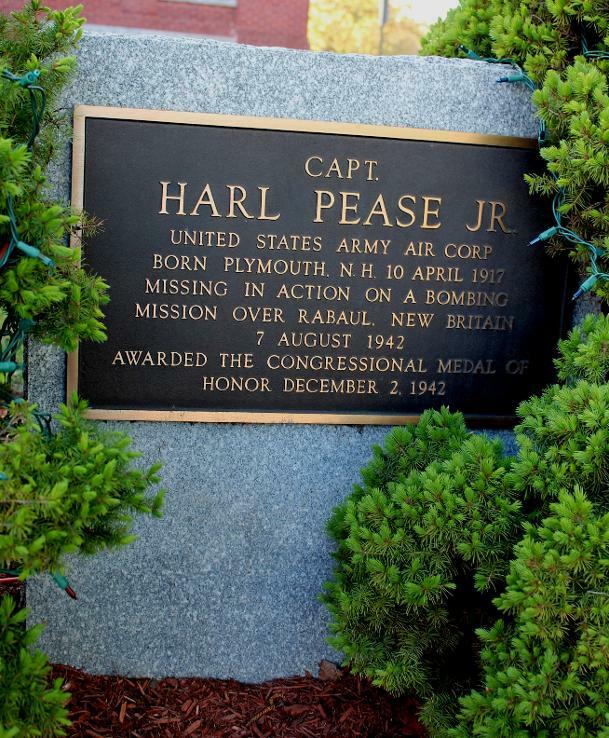 Harl Pease Jr. enlisted in the Army Air Corps in 1939. He served as a Captain in the 19th Bomb Group, U.S. Army Air Corps in the Pacific Theater. During a bombing mission over New Guinea on August 5, 1942 one of the engines on his B-17 bomber failed, forcing him to return to an Australian base. There, he selected an aircraft deemed unready for combat missions, but air worthy. Leaving early in the morning, he flew throughout the day, and rejoined his squadron at Port Moresby, New Guinea. 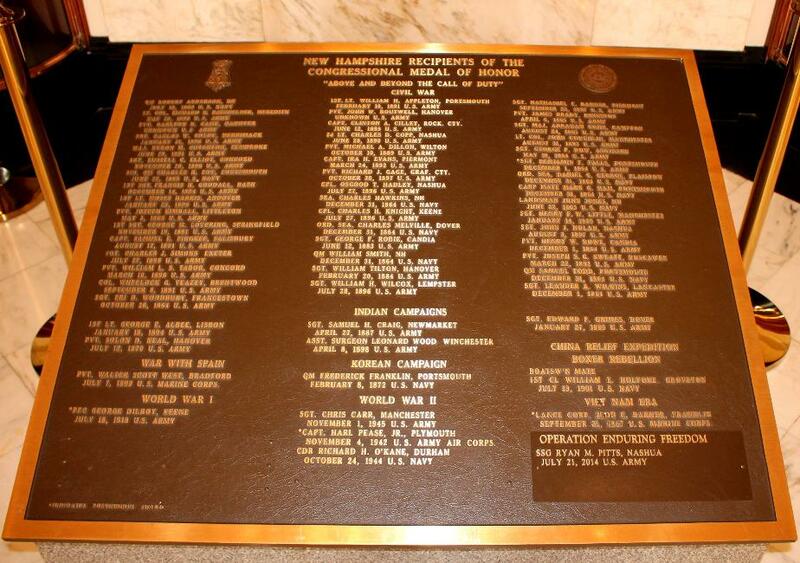 On August 07, 1942, the squadron took off for an attack on a Japanese held airfield near Rabaul, New Britain. The squadron was attacked by about thirty enemy aircraft before reaching their target. He being on the wing of the squadron was able to shoot down several Zeroes and managed to drop his bomb load on the hostile base. His plane was damaged in the attack and fell behind the squadron. The enemy succeeded in igniting one of his bomb bay tanks which he jettisoned, but it was believed that he and his crew were eventually shot down, as they did not return to the home base. In September 1942, a Roman Catholic Priest, Father George Lepping was taken as a prisoner to a Japanese camp near Rabaul. He reported that he found Captain Pease and one his crewmen at the prison camp. Father Lepping reported that Captain Pease, three Americans and two Australian prisoners were taken into the jungle, were forced to dig their own graves and executed by the sword. On December 2, 1942, the Medal of Honor, the Distinguished Flying Cross with an Oak Leaf Cluster, and the Air Medal was posthumously awarded by President Franklin D. Roosevelt to Mr. and Mrs. Harl Pease Sr.
For conspicuous gallantry and intrepidity above and beyond the call of duty in action with the enemy on 6–7 August 1942. When 1 engine of the bombardment airplane of which he was pilot failed during a bombing mission over New Guinea, Capt. Pease was forced to return to a base in Australia. Knowing that all available airplanes of his group were to participate the next day in an attack on an enemy-held airdrome near Rabaul, New Britain, although he was not scheduled to take part in this mission, Capt. Pease selected the most serviceable airplane at this base and prepared it for combat, knowing that it had been found and declared unserviceable for combat missions. With the members of his combat crew, who volunteered to accompany him, he rejoined his squadron at Port Moresby, New Guinea, at 1 a.m. on 7 August, after having flown almost continuously since early the preceding morning. With only 3 hours' rest, he took off with his squadron for the attack. Throughout the long flight to Rabaul, New Britain, he managed by skillful flying of his unserviceable airplane to maintain his position in the group. When the formation was intercepted by about 30 enemy fighter airplanes before reaching the target, Capt. Pease, on the wing which bore the brunt of the hostile attack, by gallant action and the accurate shooting by his crew, succeeded in destroying several Zeros before dropping his bombs on the hostile base as planned, this in spite of continuous enemy attacks. The fight with the enemy pursuit lasted 25 minutes until the group dived into cloud cover. After leaving the target, Capt. Pease's aircraft fell behind the balance of the group due to unknown difficulties as a result of the combat, and was unable to reach this cover before the enemy pursuit succeeded in igniting 1 of his bomb bay tanks. He was seen to drop the flaming tank. It is believed that Capt. Pease's airplane and crew were subsequently shot down in flames, as they did not return to their base. In voluntarily performing this mission Capt. Pease contributed materially to the success of the group, and displayed high devotion to duty, valor, and complete contempt for personal danger. His undaunted bravery has been a great inspiration to the officers and men of his unit. William L.S. Tabor. Born in Metheun Mass.Civil War Congressional Medal of Honor Recipient. He served as a Private in the Union Army in Company K, 15th New Hampshire Volunteer Infantry. He was awarded the Medal of Honor for action at Port Hudson, Louisiana in July 1863. His citation reads "Voluntarily exposed himself to the enemy only a few feet away to render valuable services for the protection of his comrades."